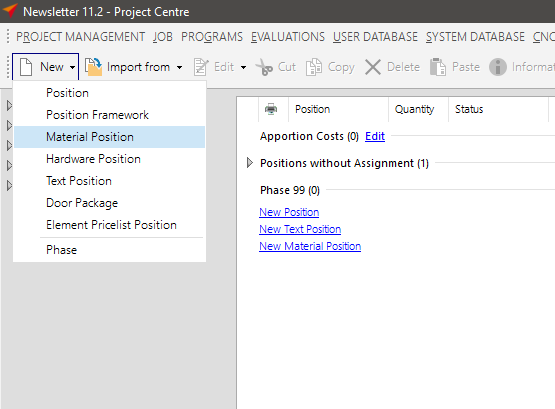 In the project center you can create material positions. These may include quantity and length items, hardware, fillings and additional articles. 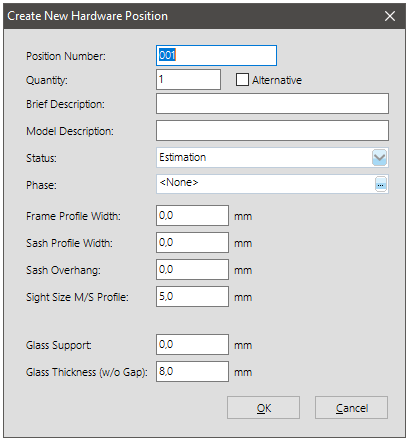 Material positions are displayed separately on the estimation. 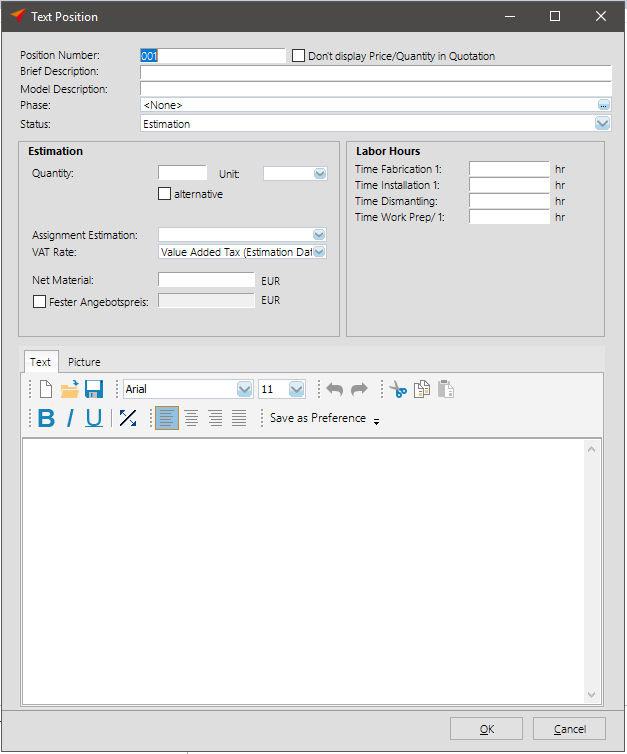 Click in the project center inside the toolbar on the arrow right to the button „New“ and select the option „Material Position“. 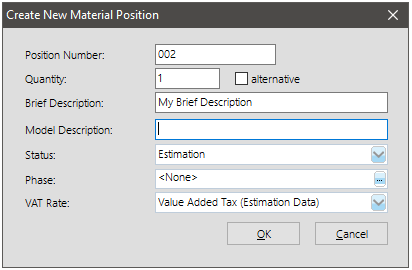 Enter the properties for the material position. At the first programme dialogue you can enter additional articles. These can be both – quantity and length items. A programme dialogue for glasses and panels will open. More details about how to use fillings you can read under > Glazing. Click on the option „Hardware“ at the navigation on the bottom. The hardware dialogue will appear. Detailed information you will find under > Hardware. Click on the option „Additional Data“ at the navigation on the bottom to enter additional data for the material position. Detailed information you will find under > Additional Data. 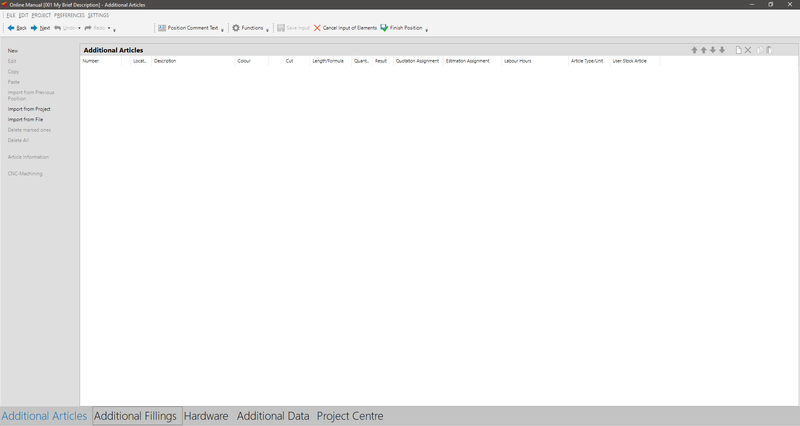 You can create separate hardware positions in the project center. Click in the inside the toolbar on the arrow right to the button „New“ and select the option „Hardware Position“. Create the position for the hardware. The entry of the hardware articles follows the same way as in the element input. For more information read the chapter > Hardware. After completing the position, the hardware positon will be considered in the estimation and displayed on the reports. You can create separate text positions in the project center. 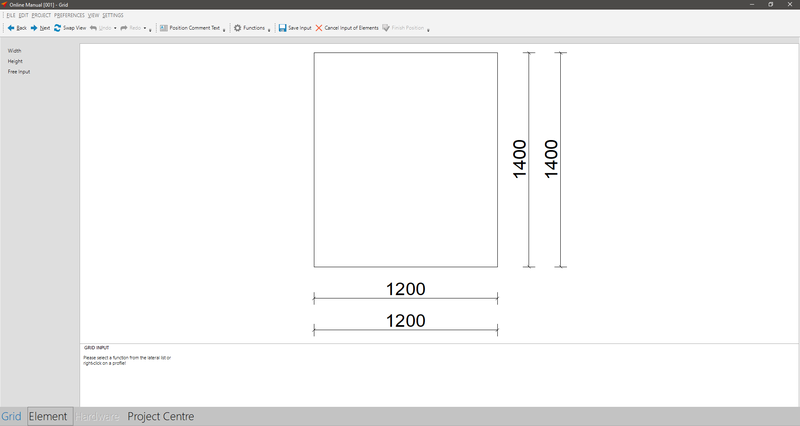 Click in the project center inside the toolbar on the arrow right to the button „New“ and select the option „Text Position“. In addition to texts, you can also enter estimation data and labour hours here. The data you enter will be included in the estimation and will appear as an independent position on the printouts.